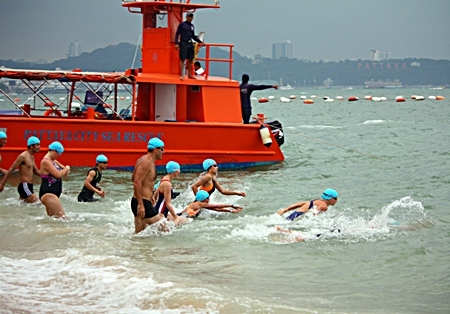 More than 55 children and adults swam across Pattaya Bay for charity at the ninth Rotary Club of Pattaya-Jomtien Cross-Bay Swim. Club President Dieter Reigber kicked off the day-long series of swims and fun Nov. 25 at the Hard Rock Hotel. 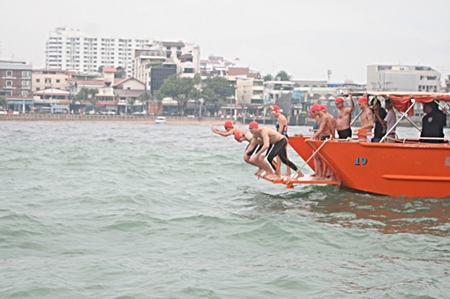 The event featured a 600-meter “fun swim” from the Hard Rock to Central Festival Pattaya Beach; a competitive “short” 1.2-kilometer swim to the Dusit Thani Hotel, and the 3.5-kilometer main event from the waters off the Siam Bayshore Hotel. Funds raised by swimmers go to help Pattaya’s youth and disabled, including health care and scholarships. The Rotary’s Children’s Fund, in the past, has supported the project including clean water for schools and family homes. President Dieter Reigber welcomes everyone to the 2012 Rotary Charity Cross Bay Swim. Swimmers young and old, accomplished or novice jumped in for charity. 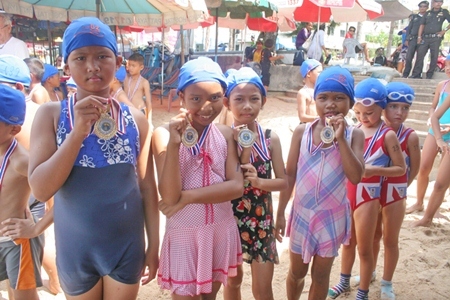 The noontime fun swim saw 34 children and teens from the Child Protection and Development Center, Ban Jing Jai Foundation and Pattaya Redemptorist Foundation finish the course. All received medals and got lunch free at McDonald’s from Central Festival Pattaya Beach. Twelve adults and teens completed the 1 p.m. short swim, braving a heavy downpour to do so. Mark Liunev reached the finish line in 30:12 minutes for first place in the men’s division. Pichet Khokrodsamrong placed second with a time of 35:50 and Nattapol Yingyuad finished third just a little ways back. Pesuso Gym Taekwondo performers show their skills in the after race party. In the women’s bracket, former champ Natalia Lunev again took first with a time of 26:18 minutes. Jasmine Gebbie finished at 27:08 for second place and Jojina Wilson took third in 29:10 minutes. 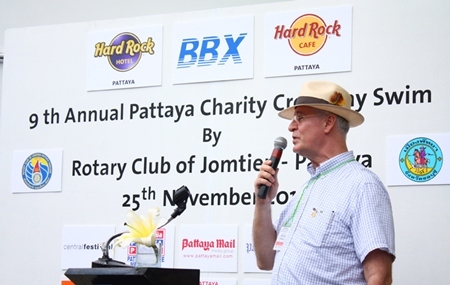 All winners received trophies from the Rotary Club of Pattaya-Jomtien. In the 2 p.m. main race, ten swimmers reached the finish line with former winner Nic Wilson breaking a Cross-Bay Swim record with a time of 36:34 minutes. The previous record, which he set, was 42:11 minutes. The top female finisher was Margaret Grainger finished with a time of 65:12. In the men’s division, second place was won by Luke Gebbie with a time of 37:22 and third by Christopher Lo at 47:40. In the women’s bracket, Kristina Solheim – the only other woman to do the 3.5 km. swim, took second in 67:38 minutes. 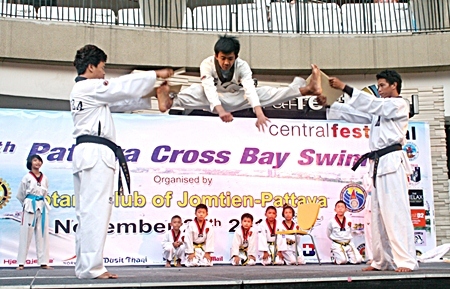 In the evening, the Pattaya-Jomtien club presented awards to all the winners at Central Festival. The ceremony also featured a stage show from children at various foundations and sponsors. Swimmers begin the 1.2 km competition in heavy rain. 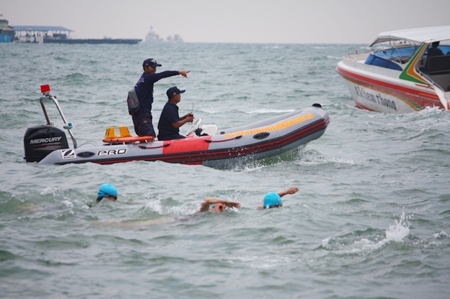 Sea rescue officers closely monitor the safety of the swimmers. These boys from the Human Help Network Foundation are determined to win the race. Ronny Heltne (right) explains the rules to swimmers of the 1.2 km race from in front of the Hard Rock Hotel. Swimmers begin the long distance swim. Mark Lunev gives last minute pointers to his daughter before the Fun Swim Competition. Fun Swim swimmers pose before competing. 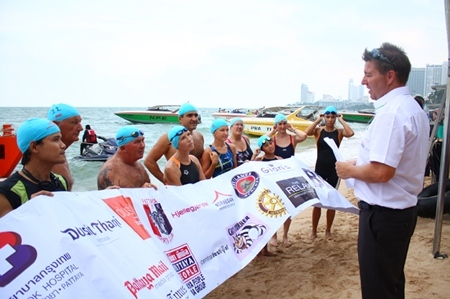 Pattaya sea-rescue officers explain markers and routes before the long distance swim. Nic Wilson, champion of the 3.5 km race, makes his way from the sea to the finish line. Two time champion Nic Wilson shows off his medal. 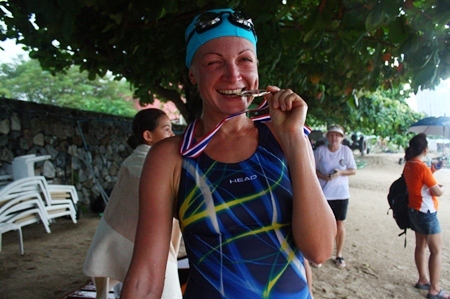 Natalia Lunev shows off her medal after winning the 1.2 km swim. 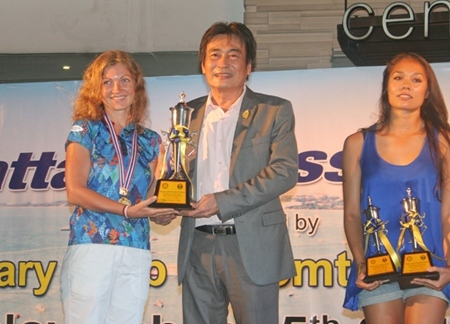 Natalia Lunev (left), winner of the female division in 1.2 km short swim, receives her trophy from Deputy Mayor Ronakit Ekasingh. (L to R) President Dieter Reigber poses for a picture with the first three swimmers in the 1.2 km race: Jojina Wilson, Natalia Lunev and Jasmine Gebbie. 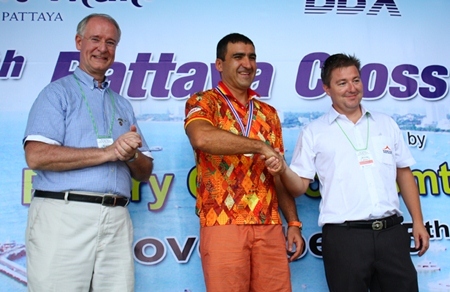 Ronny Heltne (right) congratulates Mark Lunev (middle), winner of the 1.2 km male category, as President Dieter Reigber applauds. 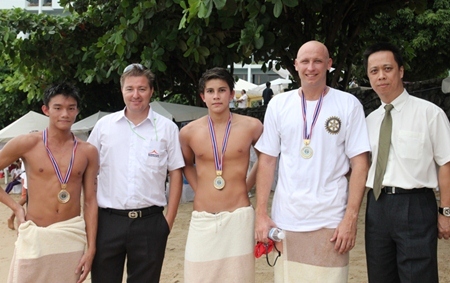 (L to R) Third place winner Christopher Lo, Ronny Heltne (Cross Bay Swim manager), 2nd place finisher Luke Gebbie, long swim champion Nic Wilson and Neoh Kean Boon, resident manager of Dusit Thani Pattaya. Children show their medals from the Rotary Club of Jomtien-Pattaya. 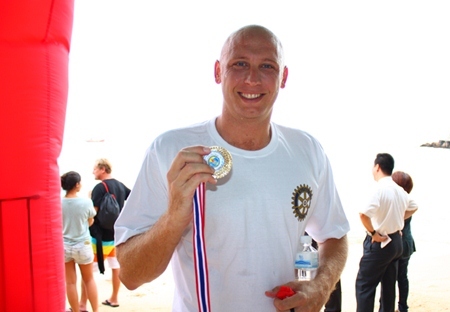 Rotary Jomtien-Pattaya PP Gudmund Eiksund presents medals to children competing in the Fun Swim for families, children and youths. 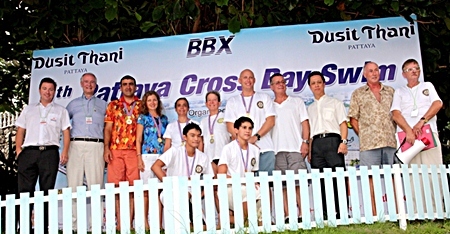 Neoh Kean Boon (3rd right), resident manager of Dusit Thani Pattaya poses for a photo with officials and some of the winners of the 9th Pattaya Cross Bay Swim. Dusit Thani Pattaya has sponsored beach towels and other essentials, buffet lunch for the swimmers and event organizers since the charity swim held its debut nine years ago. 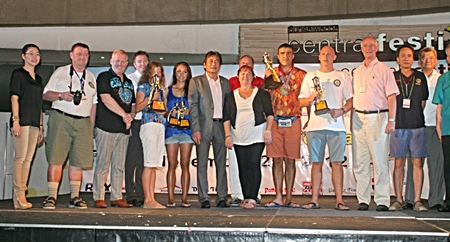 Winners and sponsors gather on stage for the 9th Rotary Pattaya Cross Bay Charity Swim award presentation and closing ceremony.